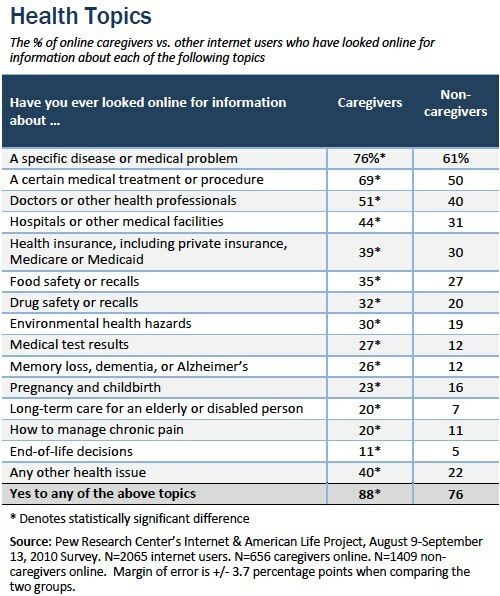 A new Pew Internet/California HealthCare Foundation report is out today: Family Caregivers Online. I thought I’d give some background on why we did the study and a few key take-aways. 30% of U.S. adults are currently caring for a loved one and it cuts across most demographic groups. We all have a good chance of playing that role some day. As a researcher, I try to identify “lead users” of technology because it’s a shortcut to insights about the future. I spend a lot of time talking with people living with rare disease, for example, as well as moms of young kids with health issues because I see them as the alpha geeks of social tech in health (to borrow Tim O’Reilly’s phrase). Caregivers fit in to that category since they are on the front lines of health care (holding the system together like duct tape, as MaryAnne Sterling puts it). One surprise for me was how actively caregivers seek out health care reviews and ratings. As an example, they are the most likely group to look at drug reviews online – 38% vs. 18% of other internet users. And it’s not just because of their other demographic characteristics. We identified a “caregiver difference” in the data. This has implications for health care providers and businesses seeking to reach an aging population – caregivers might be their best target market. We are at the beginning of a serious aging trend in the U.S. and at the beginning of a trend toward asking people to act more like consumers. There are going to be more elders in need and more health care choices in the coming years. This research shows that their loved ones not only shoulder the responsibility for physical care-taking, but for decision-making, too. Another aspect I loved reporting was how social caregivers are when it comes to seeking help from friends, family, and people who are in the same health situation. Details are in the report section entitled “In the moment of need.” For example, 70% of caregivers say that the last time they had a health issue they turned to their friends and family members, either online or offline. By contrast, 47% of non-caregivers did so. Interesting results, definitely reflects the experience of the caregiver who often cannot leave the house without his/her loved one for long periods of time. The internet serves as the caregiver’s greatest resource. We would be interested to see how often the caregiver feels satisfied with the information available online! Thanks for sharing this study. At any point in your LAST search for health information online did you feel any of the following things? (First/Next) At any point, did you feel…(INSERT ITEMS: ROTATE)? I like the idea of asking a few questions specifically of/about caregiving, though. Please keep the suggestions coming – we are writing the questions this week & next. My quick answer: 24% of US adults care for an adult; 3% for a child; 3% for both. CARE2: In the past 12 months, have you provided UNPAID care to an adult relative or friend 18 years or older to help them take care of themselves? Unpaid care may include help with personal needs or household chores. It might be managing a person’s finances, arranging for outside services, or visiting regularly to see how they are doing. This person need not live with you. [IF RESPONDENT ASKS DOES GIVING MONEY COUNT:] Aside from giving money, do you provide any other type of unpaid care to help them take care of themselves, such as help with personal needs, household chores, arranging for outside services, or other things? CARE4/5 Is this person a parent of yours, or not? Are any of the adults you care for a parent of yours, or not? It really seems to indicate that we’re not online researching and managing our own health until someone else is needed to help us do that. Once a caregiver is knee-deep in caregiving and researching their loved ones’ health issues, they are probably more plugged in to their own health issues too! Which led me to check out Treato, of course. Watch the video on their home page – very funny, deepens my interest in learning more about the data Gideon describes! Unexpected outcomes of caregiving may be that with more caregivers and a generation of caregivers they may end up being more educated about managing their own health issues. We’ve always thought baby boomers would be more active and demand better coordinated health services etc. – this caregiving trend may really emphasize that even more! The challenge, of course, is that a lot of these situations are not “transformable.” You just grit your teeth, hold hands, and get through it, right? The data from this study makes sense and it all seems to hang together like puzzle pieces. To me the only real surprise is the magnitude of the caregiver activity. And, as you suggest, Susannah, the sphere of caregivers is expanding, rapidly. The thought it triggers is that this data is the 10,000 foot level view of the subject. The data just makes me want to see each aspect explored in more detail. For sure caregivers resort to the internet for information. Is that good news or bad? The internet is appalling if what you’d like is a well-thought-out, well-curated, easily accessible, comprehensive, comprehensible source of health information for people. This takes me back to our discussion of Watson. “Watson, please save us! !” Only somebody like Kevin Kelly could love the “self-organizing system” of the internet. I read an article a couple of years ago that said, as I recall, that the European Union is spending the money to put together a free, fully accessible, comprehensive database of curated health information that will be available in all European languages. It is government sponsored and free from the profit biases of private databases (something that would be impossible in the US). I would give my right testicle to find that article again. Who knows if the project it has survived the “austerity” of the times. I hope so. If it happens it’ll be a resource to the whole world. Looking at the survey I want to ask if the Pew organization has the resources to do some in-depth interviewing of a subset of the survey? Too much of the detail of how these things really work is left out in a survey. In fact, it would be great to have an ongoing panel of everyday users to help frame future data collection and to spell out how internet use by caregivers in daily practice works…or doesn’t. Of particular interest to me would be how the ubiquitous “social media” are playing a role. I suspect it’d be pretty complex in action. Wow! Somehow I missed Susannah’s July 12 comment referring to the articles by Michael Wolff and Martin Bayne until I read through the comments again today. Those are, in my opinion, two very courageous, honest, and badly needed statements. Having been through the long, agonizing mental decline of both parents and having hung in there with my wife during her mother’s decade-long descent into dementia (not yet at an end), I can testify to the validity of what the two men said. I’ve been there…more than once. Were I a NYT subscriber, I would have added my thanks to the hundreds of who praised Wolff in the comments for having the courage to be frank about the terrible state of caregiving that so many of us have experienced. There seems to be a growing consensus that the health care system is broken, but dealing with elderly and mentally declining adults would get my vote as the brokenest of all. While it’s interesting to document that caregivers use the internet, but the issues of caregiving are so broad and deep that the survey just skims the surface. (Unfortunately there was no question of how many sought support online for the stress of caretaking.) In the near total absence of willingness to confront the many difficult issues around caregiving by the authorities of the health care, the most important aspect of the internet is that caregivers are finding sites and forums on which to seek support and to learn that the great stresses and frustrations they experience are experienced by many, many others. Doing something to make caretaking more survivable for the large population of invisible, underappreciated caretakers is going to, of necessity, be a grassroots effort. The internet is likely to be the medium by which caretakers can empower themselves and build a critical mass of impassioned citizens. The health care profession and its ancillary industries is more of a hindrance than a help when it comes to achieving a humane end to the frequently troubled end of life. Solutions will come from below, not from above. I was especially impressed that Michael Wolff put his finger on the relentless but almost aimless pursuit of life extension that is encouraged in the US health care system. Public health is bereft of any long term plan or vision for how this activity fits into a 21st century world. I’ve not been able to find any significant public health discussion of unintended consequences of unrestrained life extension. I worked for decades in an organization dedicated to ending cancer. Never once did I hear a mention let alone a discussion of the broader systemic impact of eliminating the disease. This disturbed me more and more toward the end of my career. However, bringing it up was apostasy. Single purpose advocacy organizations, medical specialty groups, and policy agencies have terrible tunnel vision. There’s very little consideration of a bigger picture. Achieving the mission is not just a goal, it is a holy quest. I used to sit in meeting at times imagining all the other meetings taking place simultaneously of ardent people committed to eliminating all the other diseases and ailments. I’d ask myself, after we eliminate cancer, heart disease, stroke, respiratory disease, etc, etc, what then? I eventually realized I was a functionary in an unacknowledged human quest to not die, of anything. In times past people handled this existential problem through religion. Now we more tangible results. Thanks so much, David! I’m glad you came back to read the comments and saw those two articles. They really are quite something. Thank you also for sharing your own insights & observations. I will join you in trying to track down info about the EU initiative but I’ll decline the offered reward if I find the article you read!! Heh-heh, thanks. Now I can relax. It’d be pretty embarrassing if you showed up at my door ready to collect! I’ve been thinking of the lessons my wife, Marilynn, and I learned from being in the ER last week. Some are interesting and some are downright humbling. Marilynn began to experience shortness of breath and a sense of higher heart rate when she stood up and walked around the house last Wednesday. The sensations persisted on Thursday and finally late Friday afternoon she called the advice nurse service at Kaiser where we get our health care. She was transferred to an ER physician who said he didn’t like the sound of what she was telling him. He recommended going to the ER either at a local private hospital or the main Kaiser hospital 45 min across town. The closest Kaiser facility doesn’t have all the equipment they might need to diagnose her situation. We thought, ugh, what a lousy trip on a Friday evening. So, naturally, we fired up her iPad and started to look at symptoms on Medscape. Marilynn became a pretty proficient online searcher last fall when her daughter, Lisa, who lives in Southern California, had hip replacement surgery. She researched the options for hip replacement and found that there was controversy and even recalls around some types of hips. That expanded the discussion of options with the surgeon. After the surgery Lisa started experiencing signs of infection in the incision and surrounding muscle. She called the surgeon’s office and explained her symptoms, but the assistants she talked to said there was nothing to worry about. Swelling and redness in the incision was not uncommon. Essentially they dismissed her concern. But the swelling got worse so Marilynn dug down into medical databases and journal articles about infection. She learned that infection in hip replacement is pretty rare, but, if the infection got into the hip appliance or became systemic, very serious complications could occur. My wife is very thorough. She had been keeping a day-by-day journal of what was going on with her daughter. In the face of apparent lack of concern by the surgeon, Marilynn had Lisa take phone pictures of her leg with a Sharpie outline around the swollen area. Over two days the area inflamed got obviously larger. When Lisa sent an email directly to the surgeon with a detailed chronology of her symptoms and of her communications with the surgical practice accompanied by a half-dozen pictures, the situation finally got his attention. He was on the phone and arranged an immediate appointment. In the long run Lisa was readmitted to the hospital for intravenous administration of antibiotics followed by a month of IV antibiotics at home. It was all very scary. So, after talking to the ER doctor about her shortness of breath, Marilynn again turned to online information. I think a curious mechanism kicked in. She started remembering earlier instances over the years of coughing, phlegm, and the mention of possible asthma by a earlier doctor. The outcome was that we talked ourselves into thinking it was not that serious and we could wait until Monday to see her doctor. I have a very high regard for our innate human ability to take in lots of pieces of information and to create an actionable interpretation of what’s going on. This is a cognitive/social capacity we use all day every day. I spent a couple of years four decades ago studying this phenomenon with sociologists who were trying to answer a basic question: How do we make sense of our world in real time? Interpretation can even be wrong, but it works for us in the short term. It’s also why it’s so easy to project humanness on something like Watson. On Sunday evening of last week Marilynn wrote a lengthy email to her doctor about what was going on. Monday morning the doctor called and set up an afternoon appointment. After monitoring her as she walked up and down the hallway her doctor ordered her to be taken to the main hospital by ambulance. The doctor wouldn’t even let her go home and have me drive her. The procedure in the ER took all evening. It was a whole series of tests: blood draw, chest x-ray, EKG, more blood, physical exam, etc. From an e-patient standpoint there was something going on that I suppose is getting more common. Marilynn sat in the bed with her iPad on her lap and every time a nurse or tech would come in and do another test she would immediately look it up online. By the time they came into the room the next time she’d have more questions. I remember thinking, “This is unreal!” Once a couple of nurses came in, saw her tapping away, and asked, “What’s that?” My wife said she was looking all this up. They rolled their eyes, turned on their heels and left. Our jaws practically hit the floor. After he left we meekly looked up pulmonary embolism on the iPad. This was serious business. Not like cancer, but if not treated in time it could be fatal. Eesh. Our self-diagnosis was not only wrong but put her at risk! We shoulda gone to the ER right away. So we’ve both learned a lesson: don’t be cocky about your self-diagnosis. It’s worth discussing what you’ve found with the doctors, but don’t bet your life on it. Per Susannah’s urging I wanted to make a few notes regarding cultural differences in approaches to planning around the caregiving enterprise and current infrastructure for carers. 1) Three countries offer credits towards retirement in national pension systems for caregivers of sick or disabled children (UK, Sweden, Norway) that treat the caregivers as though they were FTEs for the years they were out of the labor force. 2) Two countries (Norway and the UK) do the same for persons taking care of disabled elders. 3) The majority of EU member states do the same for child caregivers. I.E., leaving the labor force to be a mom/dad is penalized to a lesser degree. 4) There are major initiatives in Europe for technology around caregivers and elder care, most of note, the Technology Strategy Board’s Delivering Assisted Living Lifestyles at Scale (DALLAS) program which is a complement to their Whole Systems Demonstrator telehealth and telemedicine programs. And that last bit excites me. Fascinating to see that Internet use quantified. Being a cancer patient, my spouse is my caregiver (she HATES being called that, saying ‘I’m not your caregiver, I’m your wife, I love you. I’m just doing what anyone would do in the same situation.’). That being said, we’re both journalists by trade, so we both jumped on the Internet when I got diagnosed in 2006. We think differently, so it’s normal that we research differently, and together, we came up with countless helpful information along the way. What I would be curious to know on a larger scale is how the caregiver’s use of the Internet has impacted their actions/behavior with regards to doctors and doctors appointments, the medical system as a whole, hospitals, etc. In my case, I can say it changed things significantly. She always makes sure she is there for the doctors appointments, with her own set of questions for him. At times, because of a heavy dosage of pain medication or because of the situation I went to the hospital (massive pulmonary embolism to both lungs last year comes back to mind), I’m in no condition to clearly assess the scope of what I’m being offered. Because my caregiver knows as much as I do about my disease, she doesn’t hesitate to speak up, to doctors and to me, about her questions or the reasons for her reluctance to x or y procedure. Benoit, thank you! I don’t want to give away too much in a public forum, but yes, we are including questions very similar to those suggestions in the survey we are fielding next week. The data we analyzed for this caregivers report cemented our interest in exploring this group in more depth. Stay tuned to pewinternet.org for new health reports this fall.